RETIRED superstar Cyril Rioli's first stop in the AFL after-life will be to visit his father in Alice Springs before honouring him by wearing his No.1 for St Mary's. Rioli's dad suffered a near-fatal heart attack in Grand Final week last year and required surgery, the first and most critical in a series of events that caused the brilliant Hawk to call it quits this week. He is revered in AFL circles for his four flags, 2015 Norm Smith Medal and triple All Australian status, but desperately wants to join his father – also named Cyril – as a St Mary's premiership player. Rioli's dad, who has recovered from his health scare, won an incredible 12 flags for the Darwin-based Saints and is a Northern Territory football great. 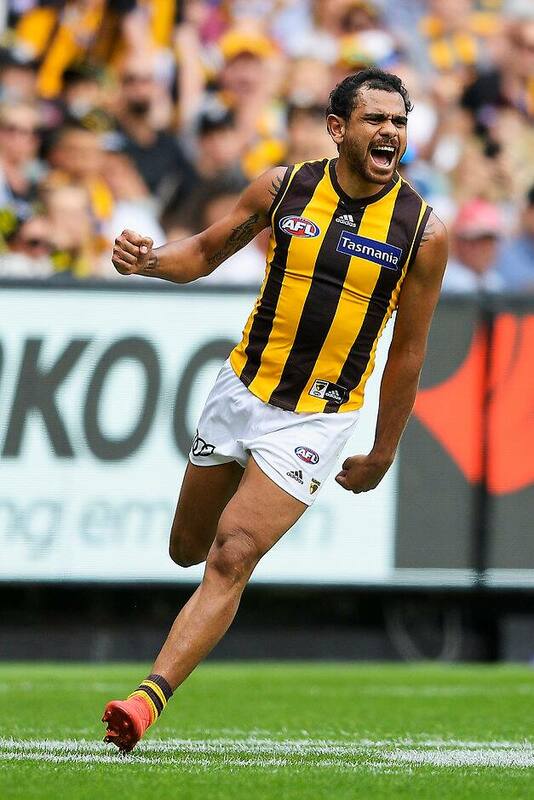 The Hawthorn champion's cousins Shannon and Ben Rioli, Maurice Rioli jnr and Jack Long played for St Mary's last season, and Anthony Long looks set to return from injury for the new season. The Saints' new coach is Rioli's 2008 Hawthorn premiership teammate Brent Renouf, who is married to Narelle Long, daughter of former club champion Steven. Part of the appeal for Rioli being back in Darwin is how he can blend in without being mobbed wherever he goes, evidenced only a fortnight ago when he ran the barbecue at a local soccer match. AFLNT chief executive Stuart Totham has reached out to Rioli's manager, former Essendon footballer Adam Ramanauskas, but is wary not to put pressure on. Ramanauskas met Totham's predecessor Michael Solomon in Melbourne just before Christmas to discuss Rioli's post-playing job opportunities. "I'd absolutely love to have him involved in our organisation and talent programs," Totham told AFL.com.au. "I'd love to see him back playing for St Mary's, the club his family has such a strong affiliation with, and I'd love to see him playing with NT Thunder. "His uncle (Michael Long) was an instigator of NT Thunder and his cousins are playing with the team, as well as Shannon (Rioli) being captain, so it would be fantastic to see him play." Rioli's looming path, should he choose it, to playing football in the Top End again and earning his future bucks on AFLNT's payroll is a well-trodden one. Jared Brennan and Matt Campbell are two of the recent home-grown AFL footballers to not only return but also work for AFLNT. Brennan worked with remote-living kids at the Michael Long Learning and Leadership Centre – the home of NT football which incorporates TIO Stadium – while Campbell is AFLNT's development coach. They played for their respective junior clubs, Southern Districts and Darwin, in the 2017-18 NTFL season and suited up for Thunder in the NEAFL since their AFL careers ended. The unique nature of the Territory football calendar means players can basically compete all year round, with the NTFL season running from October to March. Many ex-AFL footballers have played for Thunder, including dual Norm Smith medallist Andrew McLeod, Richard Tambling, Brennan, Campbell, Raphael Clarke, Alwyn Davey, Jason Roe, Joe Anderson and Liam Patrick. Dom Barry pulled on the boots for Thunder in between playing for Melbourne and resuming his AFL career with Port Adelaide, while Xavier Clarke and Michael McLean coached the club. "I was CEO of Thunder when we made the phone call to Andrew McLeod after he retired and it took a while to get it sorted, but he was really keen to play," Totham said. "It's really hard to say what will happen, without speaking to Cyril or his manager. Cyril might not be interested."